Tottenham have begun laying the turf at their new stadium, raising hopes the team could be playing there before the end of 2018. Spurs were originally due to start playing in the 62,000-seater arena from September 15 only for failures to "critical safety systems" to see the move date delayed. The club is yet to announce a new date, with Wembley continuing to host their Premier League and Champions League commitments, although boss Mauricio Pochettino admitted last week that he was confident his team would be playing in N17 before the end of the year. 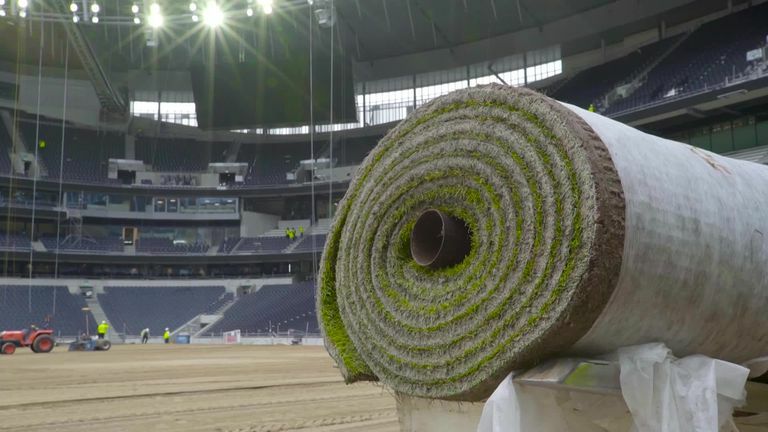 And the club shared pictures of the first rolls of turf being laid at the stadium on Tuesday. The Spurs website said: "The turf is being brought to the UK in 23 refrigerated lorries over the course of the next three days. "Each strip of turf is cut at 2.4m wide x 12m long, with each roll weighing approximately 1.5 tonnes. "The rolls will be lifted and laid by specially designed machines to accommodate the weight." Spurs groundstaff have been in the Netherlands for the last eight weeks overseeing its transportation to London for what the club have called "an historic moment." Meanwhile, Spurs will continue to play home games at Wembley, starting with their Champions League tie with Barcelona on Wednesday evening. The game against Manchester City on October 29, which is live on Sky Sports, will be at Wembley, but Spurs are yet to confirm the venue for their next home Premier League match, against Chelsea on November 24.